Posted in: Brian's Presentations. Tagged: alien life. Posted in: Brian's Presentations. Tagged: astrobiology, exoplanets. Posted in: Brian's Presentations, Meetings. Tagged: exoplanet eclipses. Posted in: Brian's Presentations. Tagged: boise state, physics. Posted in: Brian's Presentations. Tagged: drake equation, exoplanets. 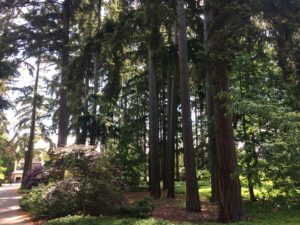 A pine grove on Puget Sound’s campus. Just recently returned from the meeting of the Northwestern Section of the American Physical Society, which took place on the lovely campus of the University of Puget Sound. It was a cozy meeting of physicists and student physicists from throughout the northwest, and there was a variety of talks and posters on topics from gravitational waves to DNA computers to diversity in science. One of the talks that really stuck out in my mind was the banquet presentation from Puget Sound’s Prof. James Evans about the antikythera mechanism, a mysterious barnacle-encrusted gearwork recovered from an ancient Grecian shipwreck. Constructed by an unknown artisan in about 200 BC (according to Evans), the machine could track the date, follow lunar phases, predict solar eclipses, and even maybe show planetary motions — all with the turn of a single crank. For my presentation, I gave a brief overview of exoplanet astronomy, with a focus on how these discoveries have begun to hone our ideas about alien life and extraterrestrial civilizations. I’ve posted by presentation below.